Home > Articles > News > East, West, Who’s Best? I was down in the very splendid library of the Society for Roman Studies, looking for a book and happened by chance to notice a title Rome and China. I thought, ha ha!, this is a book for me. Since I am devoting my semi-retirement to writing my ‘big book’, a history of the world in which I am putting the world to rights (you can read the chapters so far on www.civilization.org.uk), I am indulging in these cross comparisons, so this is just the sort of book for me. I found it was written, or rather edited by Walter Scheidel who also contributed by far the best chapter on a comparison of Roman and Chinese money. This led me to pick up once again another book comparing Rome and China which I had been sent for review entitled Why the West Rules — For Now by Ian Morris — Profile Books £25. This is by far the worst book produced so far in the 21st century. At 750 pages it is far too long and one just itches to get out one’s red pencil and edit down, because inside this very bad book there is a very good book struggling to be let out. So I spent the Christmas holidays pecking away at it, and learning an awful lot about the Chinese civilisation. Walter Scheidel and Ian Morris both come from the same university: Stanford. Stanford University is in California, and is the only private university in California, competing with the monstrous public University of California with its numerous campuses spread over the state. Stanford however competes hard. Not only does it house the Hoover Institution, a notorious right-wing think tank, but it also specialises in computers. Hewlett and Packard were both doctoral students there, but more recently Google was founded there by two young students who hogged the entire university’s computing capacity until eventually they had crawled through and indexed the quarter of the entire world’s web sites, and were thrown off the university’s computers into the welcoming arms of venture capitalists. What does the Department of Classics do to keep the flag flying against such competition? The answer is to send out a raiding party to raid the universities of Europe. They went to Vienna where they captured Walter Scheidel, the rising star of Austrian classicists, and they also carried off Ian Morris, originally from Cambridge. (They also carried off Ian Hodder of Catal Huyuk fame — but that is another story). Having arrived in Stanford they had to demonstrate their value by showing that the classics are relevant, which meant indulging in cross-culture comparisons. Ian Morris therefore has been indulging in the old game of East, West who is best. Were the Chinese really better than the Romans or was it vice versa? Well, the United Nations had set up a Human Development Index, comparing the different countries of the world by a variety of different classifications. So he thought he would set up the same sort of thing for the ancient world, and in particular for China and the West: specifically Greece and Rome. He set up what he called a social development index — the details are promised ‘soon’ on his web site at www.ianmorris.org . Here he uses four indices. The first and the most secure is the size of largest settlements. Then, somewhat more dicey, comes the ability to make war. Then comes what he calls information technology, which is what we would call literacy, but they would call that ‘information’ technology in Stanford, wouldn’t they! And finally comes energy capture (don’t ask). Well, having set up the index, who wins? 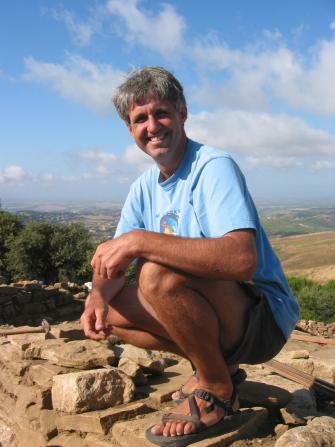 The West springs into the lead with Catal Huyuk with 1,000 inhabitants in 7,500 BC and 3,000 by 6,000 BC (when in Stanford, always support your fellow professors). The West then remains firmly in the lead: by 1200 BC, both Babylon and Thebes have 80,000 inhabitants, while the biggest Chinese city An’Yang has only 50,000. 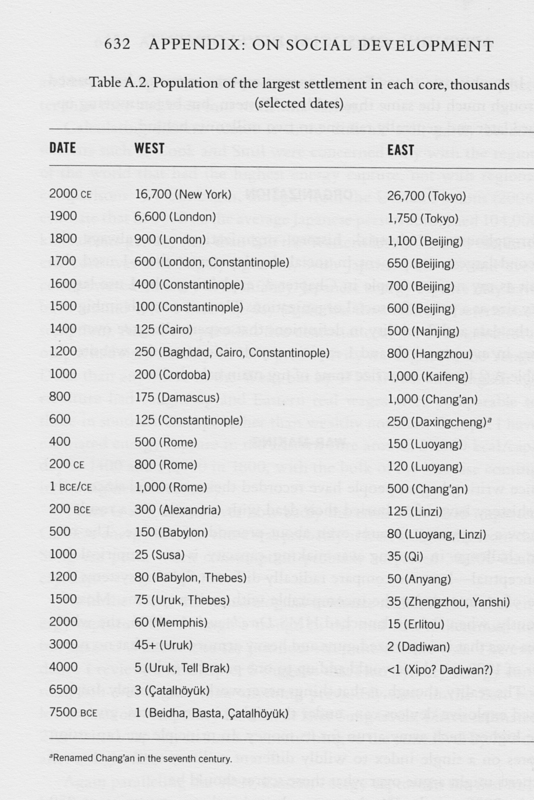 The West remains in the lead in the Roman period: at the year dot, Rome had a million inhabitants and was twice as big as the biggest Chinese city, Chang’an, which only had 500,000. Generally speaking, he argues that throughout prehistory and down to the Roman period, the West was ahead of China by between 1500 and 2000 years. The one big exception was in pottery where the East was miles ahead with the development of what is called in Japan Jomon ware. There is the suspicion that acorns can be made into a very rich source of food by boiling off the poisonous elements, and thus pottery was developed very early in the East. 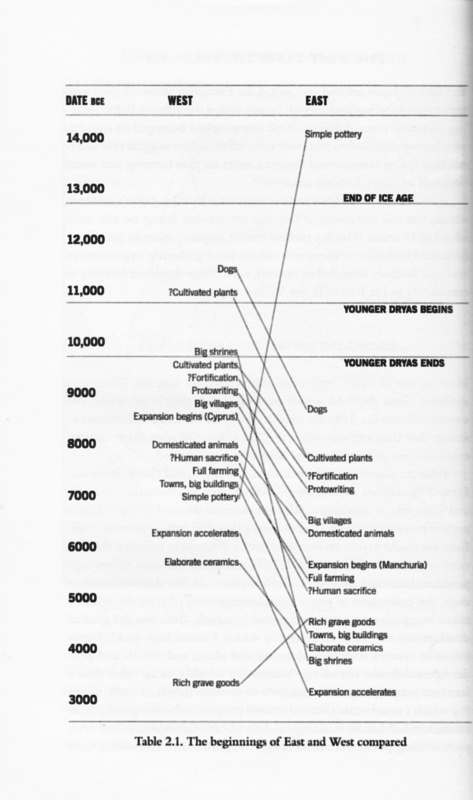 But in most other aspects – cultivated plants, big villages, domesticated animals, the West was well ahead. This analysis is of course a big shock to the Chinese who like to believe they were ahead in everything. Apparently quite recently an eminent Chinese minister was on an official visit to Egypt and was told by the Egyptians that they were always ahead of the Chinese, and he didn’t believe them, and on his return to China he set up a massive investigation of the subject. A lot of Chinese scholars were set to work and 2 million dollars later the answer came back — yes the Egyptians were ahead. The results were not widely publicised. The lead was kept throughout the Roman period, though the Chinese equivalent the Han Dynasty was not far behind. However, between AD 200 and 400, both Rome and China declined and both embraced exotic religions — Christianity in the West, Buddhism in the East. However the Dark Ages were much more prolonged in the West. In the East, there was a major revival around AD 700, and the succeeding Tang Dynasty became China’s ‘Golden Age’, when China went right ahead. By AD 800, the biggest Chinese city, Chang’an had reached a million inhabitants — the same as Rome at its height, while the biggest city in the West, Damascus, had only 175,000. Indeed those who like to compare Islam with the West, might like to note that the biggest Islamic cities were around AD 1200 when both Bagdad and Cairo reached 250,000 inhabitants — the same size as Constantinople at the same time, though both were dwarfed by Hangzhou in China with 800,000 inhabitants. 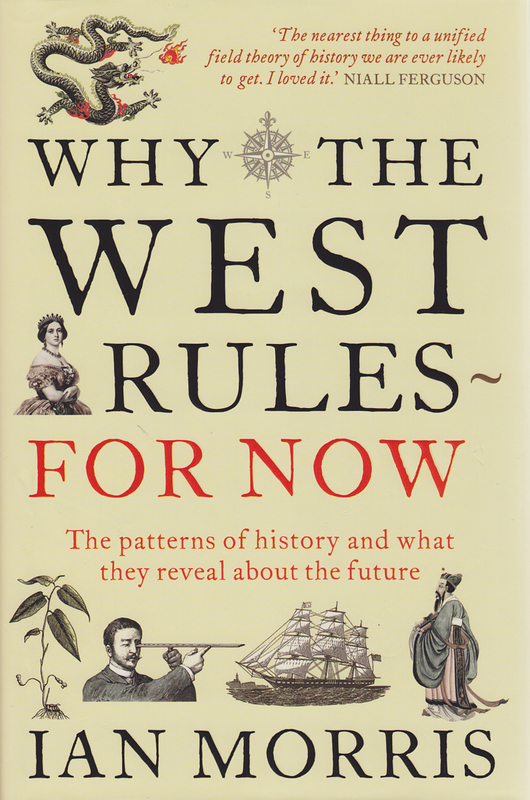 But in the second half of the second millennium, the West began to overtake China again, and by 1800 the biggest Western town, London, had reached 900,000 inhabitants — almost as big as Rome at its peak. But China was still ahead, for Beijing, by now its biggest city, had 1.1 million. However by 1900 the West had gone right ahead, with London having 6.6 million as against the biggest city in the East, Tokyo with 1.75 million. By 2000 however, the East had leap frogged ahead once again, and Tokyo had 26.7 m whereas New York only had 16.7 million. Though whether the size of the city today marks success or failure is another matter. The big question is of course is why did the Chinese retain their superiority for so long, and why did they then lose it and why did the West go ahead? Part of the reason, I believe, is monetary stability. China never suffered the terrible inflation that the Roman Empire suffered in the 3rd century. 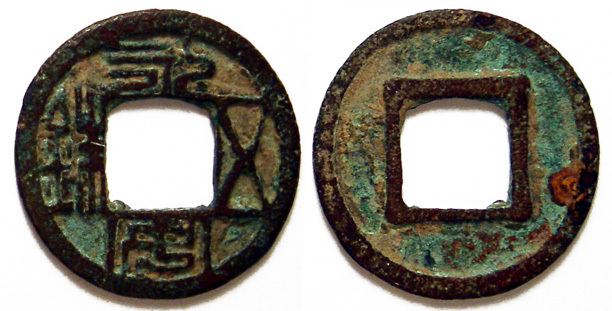 Indeed the Kaiyaun coinage introduced in AD 621, and the coiage system lasted through to the early 20th century. It was only in the 1940s and 50s that China eventually suffered terrible inflation which destroyed nationalist China and allowed it to be replaced by the Communists who reintroduced monetary stability. But the biggest aspect was surely their bureaucracy, and the invention of competitive examinations for entrance to that bureaucracy which ensured that although China was constantly being invaded by wild invaders from the deserts to the north and west, nevertheless the concept of a single unified Chinese Empire always survived, and there is always a steady supply of well-educated and clever bureaucrats. Indeed one suspects that the success of China today is based on the existence of a very clever bureaucracy. But how did the West manage to leap ahead? Partly it was through sheer bureaucratic inertia. 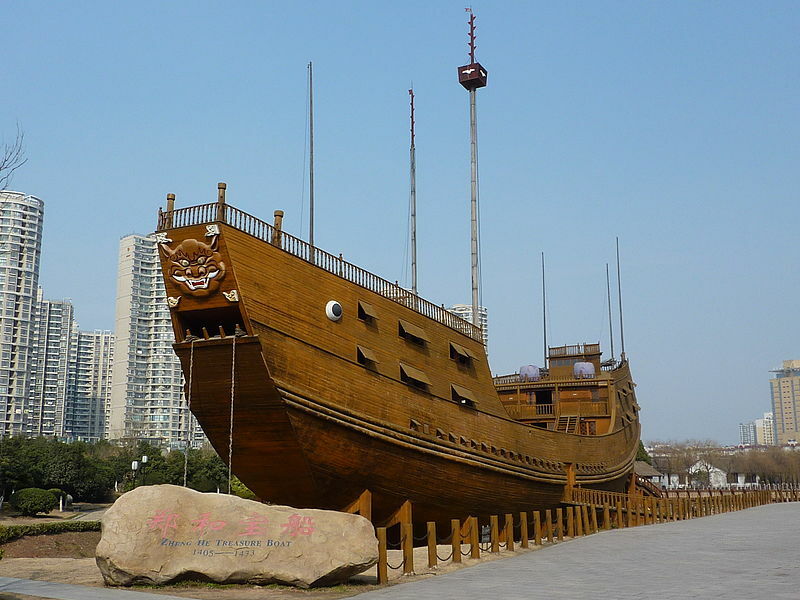 In the 15th century the Chinese built a huge treasure fleet of ships very much bigger than anything seen in the West, which under the Admiral Zheng He sailed all over the Indian Ocean and down the East coast of Africa, though not – as the popular books by Gavin Menzies argue – to America. But having made these voyages, the Chinese establishment turned against the idea of foreign voyaging, and the ships were laid up and allowed to rot away. Meanwhile in the West, smaller but tougher ships were sailing across the Atlantic and eventually around the world. I am attracted by the argument — not used by Ian Morris — that the reason why the West went ahead lay in the fact that there were a number of competing states, which because they were competing with each other encouraged the concept of free thought and enterprise and this was the foundation of the Industrial Revolution. This of course makes a strong argument against the EU, that Europe has succeeded precisely because of its diversity, and if we try and forge it into a single monolithic block, it will simply stagnate as China did. Ian Morris however, doesn’t take this argument. He believes in geographical determinism, and argues that it was because the distance across the Pacific Ocean is more than three times the distance across the Atlantic, the Europeans with their smaller ships, were able to undertake major transoceanic voyages first. Similarly because of geographical factors, although the West rules for now, we are going to be overtaken by the East. We shall see. This is undoubtedly a very stimulating book, full of wonderful ideas. Ian Morris writes well and alluringly and his learning is immense. Much of the book is inevitably devoted to China whose history is little known in the West; but when he turns his attention to Europe, one realises one is in the presence of a master classical historian. If only it wasn’t quite so long: every time a side turning appears, he wanders down it, often with fascinating anecdotes, but always in danger of losing the thread. I have only pecked at the book so far: I may have read half of it in an entirely random order, and there is still the other half to be read. This is in many ways the worst book on archaeology and history to be published in the 21st century. It is also the best. I think that the author’s guess as to why the Chinese reigned superior for so long whereas the Romans faltered is correct. If you examine the history closely Rome’s terrible inflation in the 3rd century A.D. began affecting not only their civilian life but also the military. Rome fell into an economic crisis much the same as we see today.